When I come to this beautiful part of the world, I read from the Hebrew Bible the parts that happened here. Of course, I’ve just been reading about the Angels, and what seems to be the Lord Himself, sharing with Abraham how the sin of Sodom and Gomorrah had actually cried out. And of course, that destruction caused this to be the lowest place on earth. When I read that passage yesterday, I lifted up our nation. May tomorrow’s election reflect a turning to God, and a truly repentant attitude which agrees with His Word and His judgments of what is right and what is wrong. Surely believers, regardless of party, know what candidates stand nearest to the revealed Word of God. And they will make the effort to cast a vote accordingly. When the rainbow first appeared Shelli and I were in the lounge. Everyone was looking at the stunning display. I quietly spoke into the ear of an elderly woman who was evidently religious that it was God’s token of Covenant. Then her husband, who’d been reading from his prayer book, walked up to me and made a sound, almost like a soft whistle, that is hard for me to convey, but which expresses wonder. “Ken,” I replied. I’m so glad I studied Hebrew just so I could enjoy this moment. 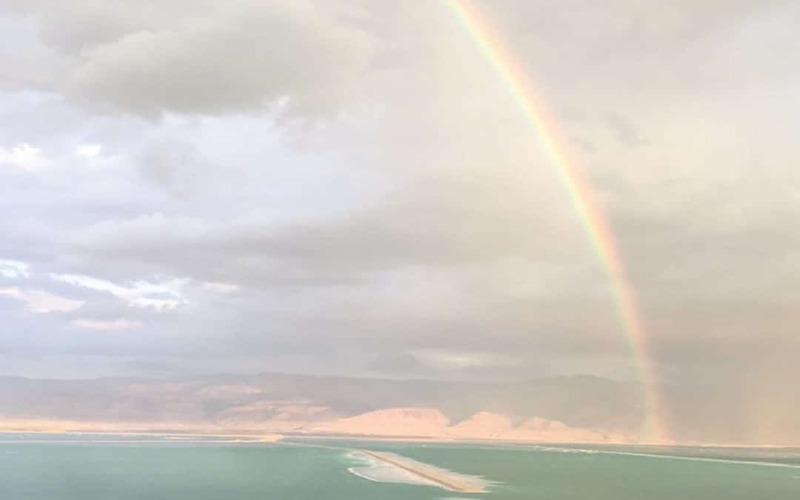 Somehow at this spectacular sight over the Salt Sea and the Mountains of Moab, I felt that God was looking directly at it and remembering…. Notice how many times the word covenant is in this passage. God is surely as He identifies Himself—a covenant-keeping God. P.S. To all you who have come to the Dead Sea with us before. It is perfect weather here. So enjoyable. Only in the 70’s and 80’s. Looks like we will have to consider a November tour here in the future. Sister Billye I am wanting to go with you this May to Israel. It is a 30 year dream for me.I am ready this next year.Thank you for your teaching and your love for the land. The sight of a rainbow brings hope to my soul. I can’t remember when I last saw one. Thank you, Billye. It was nice to hear from you today. How beautifully expressed. Two separate times of major destruction with provisions made for the remnant and after the second, the covenant of the rainbow. the rainbow has always been a covenant sign to me from the LORD. Thanks for sharing from the salt sea. I received your experience as refreshing to my soul. I wish I were there with you to enjoy. You know I claim you as my Spiritual Grandmom, ♥️😊. I missed the Israel trip with my Bishop Keith Butler, because my son had just passed in May 2017, 2 days before I graduated from PISTIS School of Ministry; and my husband had passed in June 2014. I pray for restoration of all the enemy has stolen. Recently I’d thought of how comforting it would be to see a rainbow 🌈… I guess I have, through you. I receive the Blessing. Pray for me. All my love. My heart joins yours in the pain of loss. I was widowed the first time at age 35 when my son was nine years of age. God gave me a rainbow at that time in 1984 which helped me know my son and I would get through that pain. Widowhood lasted a short time. The Lord provided a father for my son and brought an incredible husband for me. We served God, grew in our faith, my son thrived as he bonded with his stepfather…and then cancer hit again and this incredible man went to be with the Lord. Again, God gave me a rainbow as I was dealing with the diagnosis, before I even knew the outcome. God is so faithful to show us that He is with us at all times. Even when we feel we cannot go on and the loss is too great, we are blessed because we are covered by the blood of Jesus. He knows the pain. He is there to comfort and help as we move “through “ the pain to the next part of our journey. He will never leave you and He may signify that blessing of His presence with a rainbow 🌈 when you least expect it. Please allow yourself to bask in the joy of the symbolism with every rainbow and praise God because He put it there just for you. Please do the November tour, I would love to go with you to the Lord’s Holy Land. From Australia I share The Joy of remembering Gods Covenant. We are lifting up the nation of USA today. God Bless America. I just love you Dr. Brim I am so grateful for your life and example to the body of Christ. My God what a blessing you are! Oh, how beautiful! Wish I could be there, too! I’ve tried to learn Hebrew and was doing pretty well. Then changed locations & no Hebrew friends or congregations either; however, I am blessed to have a preaching pastor and only last Sunday he told the congregation about the tzizi?? Be blessed and bring some blessing home! Praise the Lord for giving you the sign of His Covenant —– it was not only with Noah, but between Him and all flesh; that includes us today. What a blessing you received there—- confirmation and reminder of His covenant. Would love to be in that November trip!!! Thank You for Sharing These Blessed Moments with us. A November trip to the Holy Lands sounds perfect! On Friday last week I was driving home to Walnut Shade, MO when I saw a rainbow with the most vibrant colors shining over the Ozark mountains. As I came to the intersection of highways 160 and 65 I saw a double rainbow with the recently erected cross in between the two arcs. I was reminded that we can stand on His promises because of the cross. We have a covenant with Him! Our forefathers had a covenant with Him and there are many of us that are renewing that covenant with Him! God bless the United States! Praise God for His sign to us. Friday in Mountain View there was a huge double rainbow so beautiful. We truly are Blessed. Thank for sharing. He has heard our prayer and will heal our land. Praise God!!! We add our agreement to your prayer for tomorrow’s elections and thank you for these gorgeous photos! You are a blessing to us and to the Body of Christ!! The Glory of G-d through His Covenant. A reminder always hangs before us. 444 (the time on your watch ) is very significant too! Thank you for sharing. It meant so much to me. I have been to Israel and as I looked at the photo it was as though I was there. My daughter is working in Amman and so it has double meaning. On this morning as I am writing from my home in the UK…it is an oasis in intercession on this great day in American history. Thank you for sharing. This made my day. Reminding me, once more of our Heavenly Father’s love or us. Would love to make that November trip. The Father has his hands on America. Shalom and enjoy. Thank you for sharing this beautiful rainbow and a reminder of the covenant with God. Thank you Sister Billye, I agree with you in prayer for our elections and who our covenant keeping God would have fill these seats in the House and Senate. And yes, i want to go with you to Israel, whatever month. May HaShem refresh you in Haertz. I love you. Thank you so much for sharing. What a blessing it was to see this beautiful rainbow and be reminded of the faithfulness of God!! Shalom, Billye! Thank you for sharing this breathtaking view! I long to see it in person! God is faithful, and His will be done today and forever! 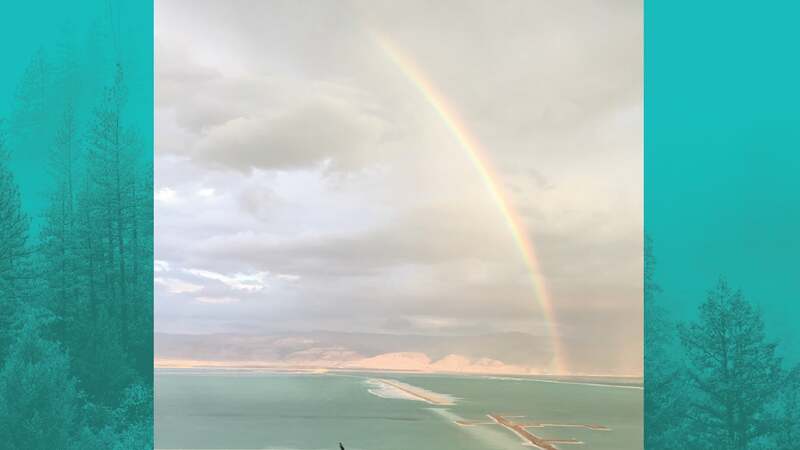 Thank you Billye for sharing that beautiful rainbow with us. I am so looking forward to the upcoming trip to Israel with you. Have a blessed day. We love you. Its always amazing to see pictures of the Holy Land…such Peace! Thanks for the amazing picture. Your blogs connect me to Israel again. I lived & worked in a Pastors home in Netanyahu for 3 years before God called me back to Canada in 1980. I’m privileged & grateful to be a partner with your ministry, Billye. Thank you Ms. Billye for sharing. I felt such anointing come through as I read. I will take it as a sign for today, voting day! We would like to go on that November Isreal trip! Praying for you and Shelly! Thank you Dr. Billye for showing us that we are one no matter where we are located!! One in Christ, one Body unified by the Love of God, the blood of the Lamb of God and the Name of Yeshua, our Sweet Lord Jesus!! This message blessed me! Thank you! Thank you for that beautiful picture. I’ve always heard and thought that rainbows only followed a rain. But our Creator God had other plans today. Ha Ha Ha!!! Glory be to God forever more and bless His Holy Name!!! Thank you, Sister Billye, for sharing this in your blog. What a blessing from our God! I choose to believe the White House illuminated in the rainbow light was a sign from God to us reminding us that the USA is in covenant with The Covenant Keeping God! The enemy meant it for evil, but our turn-around God meant it for GOOD! The very next election He gave us a God loving man who is restoring the Founding Fathers covenant. What a great way to look at that event! Thank you for this positive perspective that we will have now to replace the other 🙂 Bless you and Shalom! Love and miss you mother…from the Navajo Nation. Mother remember the word you gave me from the Lord years ago at Glorious Fellowship Church about Boston, wow…I was there for the first time last week, what a glorious experience I had with the Lord as I watched the Red Sox victory parade down town. Mother things that I have waited for all these years are finally coming to pass. My trip to Boston was one of them…Love you Mother Brim. Wow! I never knew that’s why that is the lowest place on earth! Every time I hear from Sister Billye or read her books or acrticles, God reveals something new to me. I am so hungry to learn. Thank you for your faithfulness to God and to us to share as God speaks to you. So glad you took the time to write this post talking about the rainbow and covenant. How often we forget these things especially in our times of meditation, prayer, praise and worship. God truly is a covenant maker never a covenant breaker. He truly honors His word above His name yet His name is most powerful but His Covenant oh my I can testify about that without a shadow of a doubt. Thanks for reminding us about these very important blessings of The Almighty regardless of where you are. As for the election today, God’s covenant is in place especially with America’s stance with Israel; I read in Numbers 24: 9 and Genesis 12:3. The nation is like a mighty lion; when it is sleeping, no one dares wake it. Whoever blesses Israel will be blessed, and whoever curses Israel will curse GNT. Billye, I have to tell you, I looked at the stove clock yesterday before reading this post & it said 4:44pm – I said to myself – interesting number – I follow you! Now that, Miss Billye, is a good idea! I have always tho’t that a trip to Israel in early November would be a good time to go; warm weather, no holiday crowds. Brilliant!! Would like very much to be in Israel in November. An awesome rainbow, thanks for sharing Miss Billye.